When is the last time the Jets had a 31 point quarter? I’m sure it’s happened but I’ll be damned if I know when. Props to the Jets for last night's performance. Also Detroit and Matt Patricia, defensive "guru" giving up 48 at home in your first game as head coach. But his offenses only scored 3 more points than his defense. I think it's going to be a long season for Lions fans, at least they are used to that kind of thing. I wish the Giants had the Lions instead of the Bears on the schedule this year. How, in 2018, are NFL teams still dumb enough to hire anybody from the Bill Belichick coaching tree? I'm rooting for Vrabel to do well in Tennesee. He was my favorite defensive player on those 03-04 Patriot teams. I forget who the football writer was but he tweeted a suggestion that Roger Goodell should show up to his next press event with a T-Shirt showing Patricia with a clown nose. I laughed. I'll give him a pass on the Super Bowl as I'm sure he game planned for, and would have much rather have had Butler on the field. Yup. And he made it worse by being an arrogant prick about it afterwards like how dare the press ask why he benched their best cornerback after he played like 98% of the snaps all year. I’m not sure how much of a difference Butler would’ve made. The patriots were a lot less aggressive defensively last year than they were the previous 3 because of the talent on the field. Word around Detroit is the older veterans there aren’t too pleased with him. Working them too hard. These assistants that come from the Pats don’t understand that they don’t have the credibility of a Belichick to do excactly what he does. Butler couldn't have made things worse. Statistically speaking he would have had to at least stalled one drive at some point in the game and that would probably have been enough for the Pats to squeak out a win. That was a nice well played game but at that 103 yard non-TD return to end it. The Jets won 42-34, and became the first team in NFL history to have at least 21 points from touchdowns, extra points, and/or two-point conversions and at least 21 points from field goals. Jason Myers made 7 field goals, which is tied for the second most in NFL history behind Rob Bironas's 8 for Tennessee against Houston on October 21, 2007. Myers broke the Jets record of 6 field goals from a long time ago. The old record was shared by Jim Turner on November 3, 1968 and Bobby Howfield on December 3, 1972. That game was lost when they couldn't get a TD after the blocked punt. It was just a matter of how painful it would be at that point. Was literally rooting for the Titans and so happy when they came back to win. Better draft position, another nail in Bowles coffin. Wins are meaningless at this point. Just infuriating that Darnold has been hurt/out b/c Bowles was so inexplicably inept to leave in Long, a center who could not snap the ball without putting Sam in danger, and continually put SD in empty sets with no protection. 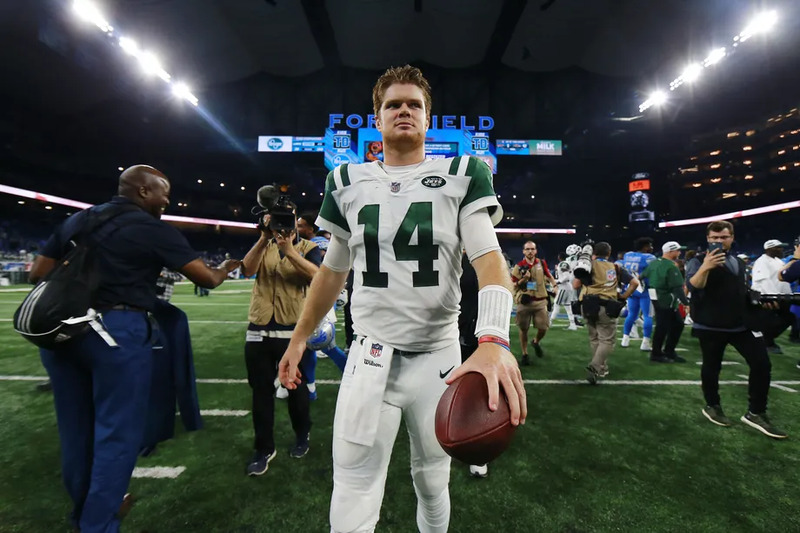 Well that was a frustrating loss, but it's been fun to watch Darnold the last three weeks. Are you guys happy with hiring Adam Gase? I don't like McCarthy either but at least he proved he can actually win a championship. Matt Rhule could have been a possibility but they didn't want to give him control over his assistant hirings. Last edited by GordonGecko; 01-11-19 at 05:30 PM.